In 1973, the writer Peter Mattiessen, George Schaller and a small team of Sherpas trekked through parts of Dolpo. 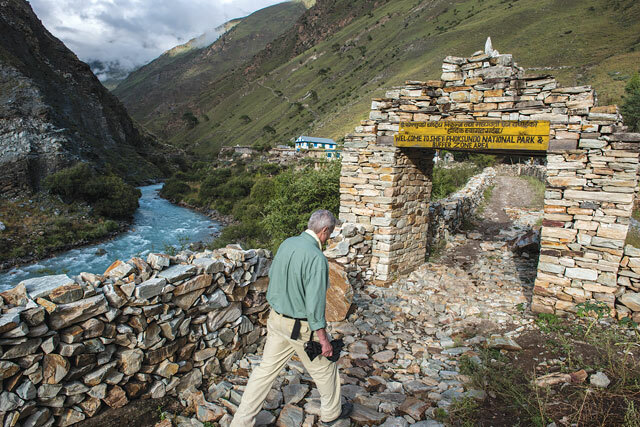 Over 40 years later, Schaller returned to Dolpo last year to retrace their route to Ringmo, Shey Gompa, Namgong, Saldang, Namdo. The trip's purpose was to note cultural and environmental changes in Dolpo over the past decades, and most of what they found was negative even though Kathmandu declared the 3,555 sq km Shey-Phoksundo National Park in 1984 and later created a 1,349 sq km of buffer zone around its edges. 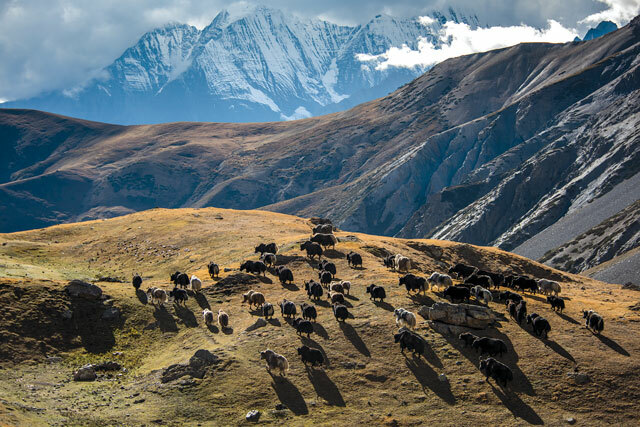 The team found that Shey-Phoksundo does not fit international criteria for a national park, given the extensive, permanent human activities throughout the park ranging from agriculture to livestock herding. It would be more accurate to call it a ‘conservation area’ like the Annapurna Conservation Area. There are, in addition, 200 Nepal Army personnel posted in the Park who mostly remain at their base at Suligad even though their logical duty would be to monitor the yarsa harvest season in May and June when thousands of outsiders invade the Park, and poachers and robbers are active. As the road network reaches Dunai, and more tourists, yarsa collectors and other outsiders come to Dolpo there has to be better regulation, improved garbage collection, and an effort to stop ugly construction. A Lake Conservation Committee responsible for keeping the Phoksundo Lake clean was formed four years ago, but hasn’t done much. The Phoksundo Buffer Zone User Committee has no staff. The Park collects entry fees from tourists and yarsa collectors, all timber licenses have a price tag. Up to half the fees are supposed to be spent for maintaining trails and bridges, but they are not even repaired near the Park headquarters. Although wildlife numbers are said to be up, the team found that there is poaching. 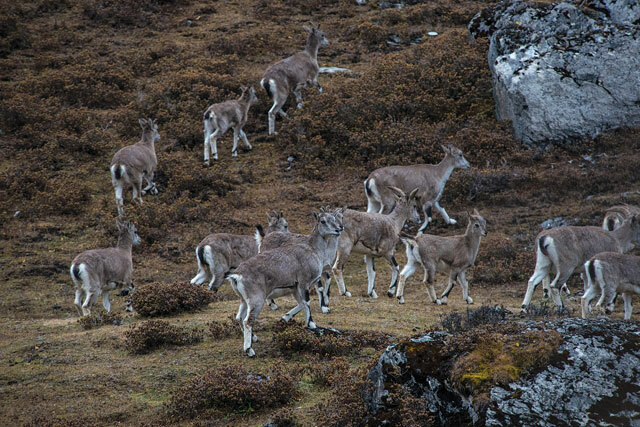 Neither the Park nor the army does much to prevent it, and most blue sheep are killed during the yarsa season for meat. There are many traps, with snared marmots and musk deer. Wolves are usually not seen in small packs, suggesting that the pups had been killed in their den by villagers in retaliation for lost livestock. The Park needs dedicated teams in the field and prosecution in the courts, as well as sincere dialogue with communities. By far the most serious problem is logging. Permits are often given for construction of non-existent schools and health posts. 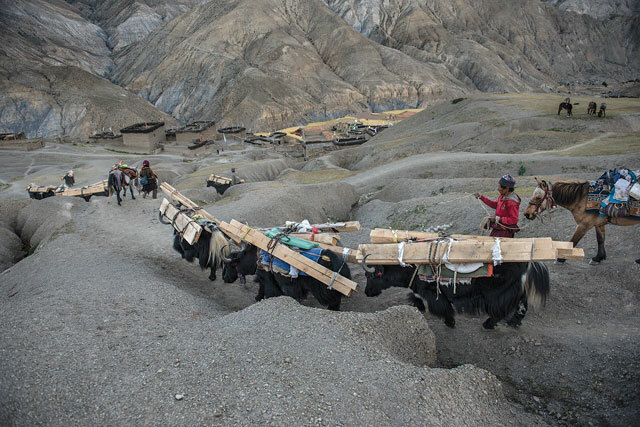 Recently, near Shey Gompa here were over 150 yaks and horses heavily laden with timber (pictured, above), most of it to be smuggled to Upper Dolpo. The other big threat is the yarsa trade. Half the annual household income for most families is from the rare and expensive caterpillar fungus. The Park charges around Rs 500 for park residents, Rs 2000 for a district resident and Rs 3000 for someone outside of the district for harvesting yarsa. One good yarsa can fetch up to $10 in China, so the Park’s fees are too low and do not compensate for the environmental impact. The Park does not limit the number of yarsa licenses and up to 20,000 people invade the highlands every summer. Over-harvesting of yarsa has led to a steep decline in production. With so many outsiders, there are often conflicts as happened in 2014 when two locals were killed in Dho Tarap by police during a dispute over harvesting. The Park should reduce the harvest season to two weeks in June, giving time for the larvae to grow. It should close the season entirely in certain years to allow the species to recover. Harvesting in the Park should be restricted to resident communities to curb over-exploitation, increase local income and help in conservation – which is what the National Park is supposed to do after all. With the emergency, guarding national parks cant be a priority for the army any more. Women are getting on with the business of living, despite those idle male hands that wreak havoc just to pass the time. "Can the prime minister dare spend a week in Rolpa?" "Capital adequacy is going to be a problem..."